As the executive branch, the Board of Commissioners may approve policies that affect nearly 1,350 full-time county employees and another 400 part-time employees. As the legislative branch, the Commissioners pass ordinances that primarily affect unincorporated (not within a city or town) areas of the county. It is the only body in all of county government that can receive bids for projects and services and sign contracts. Receive bids for projects and services and sign contracts. Authorize all claims on county budgets. Decision-making authority over planning and zoning in the county. Supervise construction and maintenance of 1,378 miles of county roads and nearly 400 bridge structures. Issue bonds or approve lease-purchase agreements to borrow money for the county. Serve as the Drainage Board, which oversees the legal drainage system in the county. Operates and maintains all County facilities, including the historic Allen County Courthouse. 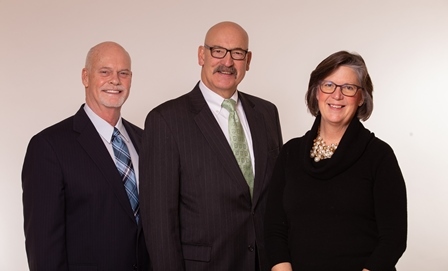 The three member Allen County Board of Commissioners serves as both the executive and legislative branches of County government. While they are required to reside within their specific geographic districts, the County Commissioners are elected at-large by all Allen County voters. You may click on a highlighted name in order to send an email to an individual commissioner or staff member.